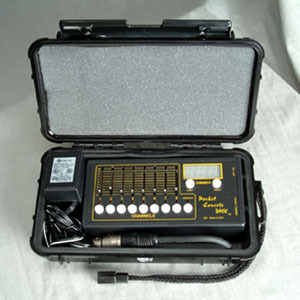 The Pocket Console® is the inexpensive source for the smallest, most graphic "hands-on" and "user-friendly" DMX-512 theatrical lighting console made. The Pocket Console® with 8-Page Patch (Moving Light and Ballroom Multi-Patch) allows EIGHT discreet pages of patch configurations! Packaged size (Pocket Console, AC adapter and instructions): 10" x 6-1/2" x 2-1/4"